The guiding principle Quality from principle has been in the foreground since 1998. 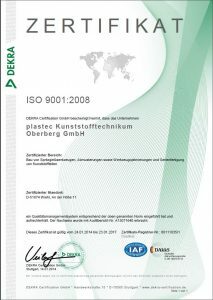 All business processes at plastec are subject to a continuous improvement process, which is continued in our quality management system certified according to DIN EN ISO 9001:2008. The security of your data, development and projects is ensured by our working methods based on DIN EN ISO 27001. 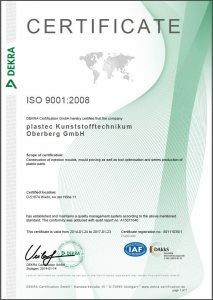 Our certification (according to OS) guarantees you the highest degree of confidentiality.